Your samples or are one of the most important parts of your online sales efforts. As great as your site is, as great as your testimonials may be, as great as your packages page may be, ultimately what clients will use to determine if they want to work with you is your past work. Put up as many samples as you can on your website. Make sure you put your best foot forward by putting up samples that showcase the best of your capabilities. If you don’t have any samples because you’re just getting started, consider doing some pro-bono work for people you already know or just doing the samples for imaginary clients to show what a finished project might look like. The idea is that you want to have something to showcase, even if it’s not paid work yet. If you’re assisting in a very visual marketplace, especially anything that has to do with graphics, then it can be to your benefit to include even more samples. Many graphic designers and web designers will set up entire portfolios on their website to better showcase these kinds examples. 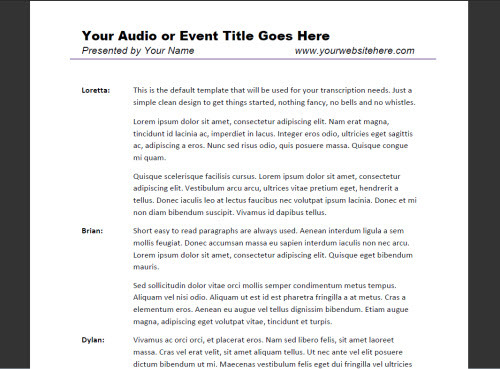 Even if you’re assisting with audio projects you can use a portfolio page to showcase snippets of audio. Samples are tricky sometimes, especially if you’re assisting with things that don’t really lend themselves to interesting visual samples. For example, on my transcription site I don’t have a lot of sample options to provide. With NDAs and private projects that aren’t for public viewing it’s difficult to use those as samples. and then I have a specific client template that I showed off with permission from the client since she posts her transcripts to the public. I also mention at the end of the samples that a custom template can be created for a specific project as an add-on purchase to a client’s order. Even just a few samples like that on your website will give the prospective client an idea of what they’ll receive when they do business with you, and that’s really all they want to know.